SINGAPORE - From March 11, Grab users can cancel their rides within 5 minutes of booking, without having to pay a cancellation fee. According to an e-mail update by Grab on Sunday (March 3), changes to the cancellation policy will be introduced to account for the fact that there may be many reasons why users cancel a ride. For example, users might key in the wrong pickup point, or drivers could get stuck in traffic. Currently, users can cancel up to two rides for free within a seven-day period, after which a charge of $5 will be imposed for each cancellation. But as part of the new policy, users will instead be charged $4 for cancelling their rides after 5 minutes - or 3 minutes on GrabShare. Also, upon arrival, drivers will wait for up to 5 minutes - or 3 minutes on GrabShare - after which they will be allowed to cancel their rides. Users will then be charged $4 for not showing up on time. 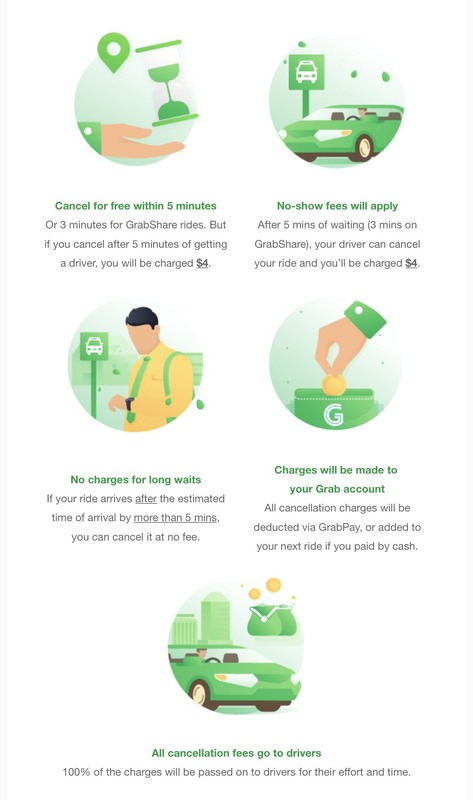 Grab said in its e-mail to users that all of these charges on users "will be passed on to drivers for their effort and time". "All cancellation charges will be deducted via GrabPay, or added to (the user's) next ride if (he or she) paid by cash," the company added. For each booking, users may be charged $4 for a late cancellation or $4 for not showing up on time, but not both at the same time. Cancellation fees will also be waived if drivers arrive after the estimated time of arrival by more than 5 minutes. For example, if the user was allocated a driver who is 3 minutes away, but waited for more than 8 minutes. The changes will apply to all Grab transport services except for GrabHitch, GrabShuttle and GrabShuttle Plus. Grab expects this policy update to affect less than 1 per cent of bookings, as the majority of passengers do not change their minds after booking. A Grab spokesman told The Straits Times: "The improved cancellation policy will allow passengers more flexibility while ensuring that we are fair to our driver-partners. "We are constantly looking for ways to improve our platform, and this is one of the ways."